Brodi Ashton: The Coolest Story Ever about Sherman Alexie. Okay, The Coolest story ever that invovles me. There are only two. Of the two, this one's the Coolest. The Coolest Story Ever about Sherman Alexie. Okay, The Coolest story ever that invovles me. There are only two. Of the two, this one's the Coolest. It's Free Book Friday! Answer the question at the bottom to enter this week. For those of you who thought Smokey wasn't really my cat, and he was just some loser hairless cat I found on the internet, here's the proof. Of course, I had to pluck out my right eyeball shortly after this pic was taken because Smokey tried to lick it. 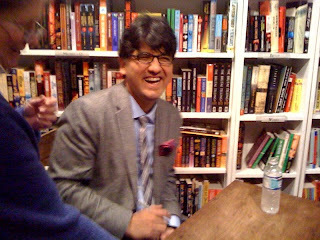 I saw Sherman Alexie speak at The King's English Wednesday night. You guys remember how much I gushed about him in L.A.? It is so big that he came to TKE to talk about his new book War Dances. 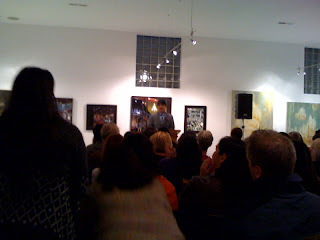 It was easily the biggest crowd I've seen at their next door art gallery. At times inappropriate (He told a joke about... um... nevermind) and at others raucous (especially when he smack-talked our own Ute Indians), his speech had people holding their bellies, laughing so hard. Like a stand up comedian. That funny. Okay, I've been holding it in for way too long. I have to tell you the coolest part of the whole night. So, I park about a block down from TKE, on the street, and as I get out of my car and onto the sidewalk, guess who's right there? Walking next to me? All by his lonesome? Sherman Alexie. Get this. He's a little ahead of me, and he immediately turns around and says, "I met you in L.A., didn't I?" There were like 2,000 other people he met there too. So I'm all, "Um, yes Mr. Alexie." He points at me. "Now, don't tell me your name..."
Me (incredulous): "Oh gosh, there's no way you could remember my-"
Me (silent as I listen for a loud crack in the universe that I'm sure is coming): Mouth hangs open. Breathing gets rapid. Hyper-Brodi emerges from her cocoon inside my chest, where she's been buried since the sixth grade, when Matt Nance said her ears were so tiny and cute, and she got all twitterpated and couldn't stop panting. Me: "Mr. Alexie. You. Just. Made. My. Life. I feel like a Beatle just remembered my name." Him (laughing): "You and your friends were the ones in the t-shirts, right?" I gasp as if he just handed me a billion dollar bill. I reach down to unbutton my sweater, and then flash him my red t-shirt. Okay, he may have backed up a step, because I sorta looked like a crazy trenchcoat flasher. He was noticeably relieved when I, indeed, had a shirt on under there, with the word "Violent" in bold black letters. Him: "That's right. You're violent. And your friends were..."
Me: "Blasephemous and Inappropriate! Blasephemeous and Inappropriate!" Passers by were probably wondering why the blond chick had stopped Sherman Alexie on the sidewalk to shout "Blasephemous and Inappropriate!" at him. *He got in trouble at BEA for saying he wanted to beat up a woman because she had a Kindle. He says, "Apparently, Kindle readers don't understand metaphors." *With a Kindle, there is no foreplay. (He proceeds to stroke the spine of his book). *Talking about people who were bored by his speech and wanted to sneak out early, he says, "But you think to yourselves, 'If I leave everyone will think I'm a racist'." *He wonders why every time he does an event, women feel compelled to wear turquoise jewelry. *He says liberals in Utah have as much power as an amoeba on an amoeba on a tick clinging to a deer's ... um... bum. Then he quips, "But it's beautiful here." *He jokes about living in Seattle. In his son's elementary school, there are "78 Lesbian couples who all adopted Asian girls, and all named them 'Grace'." So if you're sitting in class, chances are you're sitting by an Asian girl named "Grace Ming-Na Lowenstein." 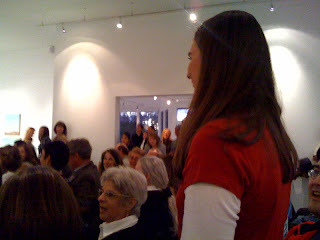 *He called out Emily Wing Smith and led the entire audience in a chorus of Happy Birthday. Later, I was in line behind Sara Zarr to get my book autographed. (Sara Z. and Sherman are peeps, you see, because that's how Sara Z kicks it. She told a story about how she heard Sherman speak maybe 6 years before her first book was published, and at the time she never, not in a googolian years, could've imagined the two of them would meet again as colleagues and nominees at the National Book Awards). I hope she blogs about that. Anyway, so she's all huggy with Sherman, and then he gets to me and my book, remembers how to spell my name, and signs it like "To Brodi- Still the Coolest Name Ever, Sherman Alexie". I stand there awkwardly for a moment. Sara Z (without missing a beat): "And that's saying something." I learned something about Sara Zarr that night. She seems unflappable. Of course, she's real friends with Sherman Alexie (not dream friends, like me) but I really can't imagine Sara Z. ever flappable. We went to the Dodo afterward for Emily's birthday, and she didn't flap once. Me: "Sara! Did I tell you about Sherman-""
Me: "The one where he remembered my name?" Me: "Did I show you the street? Where he walked, and I walked, and we walked together, and I flashed him my chest?" Me: "Oh good. Wait a sec. We haven't left the building. How could I have shown you the street? Silly Sara. You want me to show you now?" Me: "Hey Sara. Did I tell you Valynne got me Good 'n Plenty's for my b-day? I love them so much." Her: "I hate black licorice." Me: "Black licorice is supposed to be an upper." Her: "Valynne got you an upper? Hmmm..."
Me: "Hey Sara. I bet if you eat a million Good 'n Plenty's for a million days in a row, you'll acquire the taste." Me: "Hey Sara. 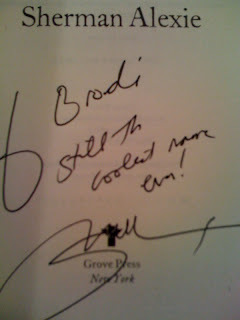 Did you see how Sherman Alexie signed my book? He laughed at my joke. He thinks I'm so funny. I would totally date him. Just kidding. He's married. He's married, right?" So how do y'all handle brushes with your own idols? Are you unflappable like Sara Z.? Or do you shake it like a bowl full of jelly in the presence of greatness, as I do? Answer, and you'll be entered in the drawing for a free book from my autographed book shelf. I knew we were moving into the same neighborhood as Shannon Hale was moving into (we got in first, just so you know), so I kept my eyes peeled for her, and she and her husband and kid were on a walk passing right by our driveway when we were in our driveway, and I just started exclaiming, "Shannon! Holy cow! Where do you live?" She pointed DIRECTLY ACROSS THE STREET and I hyperventillated more: "Are you serious?" She was cool the whole time, noted our boys were about the same age and suggested they play together, said I was welcome to come over for a cup of sugar. After that, it took days for me to work up the courage to cross the street and invite her and her kid to go to the pool with us. I practiced what I would say when she answered the door--and then I flubbed the whole thing because she was on the phone or something when she answered. "Me: "Hey Sara. 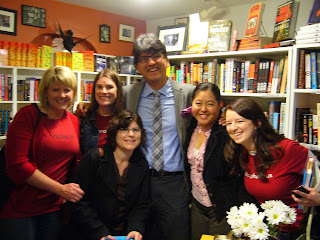 Did you see how Sherman Alexie signed my book? He laughed at my joke. He thinks I'm so funny. I would totally date him. Just kidding. He's married. He's married, right?" Just a heads up Bro, you are married too. But to be honest, I can't really compete with him...so if it works out, let me know and let me keep the truck. Nikki- I always flub it up when it really matters. So how are you now around Shannon? Does the novelty ever wear off? Sam- Dude, keep our marriage on the down low, will ya? I jest. You will always get to keep the truck, just so you know. The only famous people I've run into have been at book signings & if that's any indication of how I'd act then I'm the "shy" kind. I just kind of smile & stand awkwardly, "Hey I loved your book" as if that isn't what they've heard for the last 50 people! But, I'm just thinking that I couldn't hear it enough, right? I think it's funny that you were just worried about him being married and not the fact that you are married. Hmmmm. Every time I'm the vicinity of someone famous I act like I don't know it. I once sat in the same row at a Broadway play with Tim Robbins and Susan Sarandan. They had to stand to let me in and I couldn't even look at them. I did surreptitiously look to see what they laughed at though. I'm sure they didn't see my sly stares. Olivia- I say the same thing! I loved your book. I loved your book. I agree, that should never get old for them. Eden- Me too. I remember when we saw the lead singer of Everclear at Disneyland. Sam went up and introduced himself. I couldn't even be in the same room. Okay, so my idol idol is Ewan McGregor and I've never met him, so I'm not sure how I'd react if I did. I'm sure I'd faint or drop dead on the spot. But, when I'm around other famous people, I get all giddy and shy, which I know is a contradiction, and then try to act like I'm normal. Then, I have so much pent up energy that I have to scream at the top of my lungs after I'm far away from said famous person. For my 18th birthday, my parents took me to Vegas, so I could see Michael Crawford perform live. (He's my favorite singer.) Anyway, while we were down there, we went to Debbie Reynolds's Hotel and Casino. We didn't realize until we got there that she did a show every evening. So, my mom, my dad, and I decided to go see the show. As we were being seated, my dad gave the usher a $20 bill in hopes that he'd give us a good seat. He sat us right down in front and in the middle. During the show, Debbie came down to talk to the fans in the middle front part of the theater. She thought it was really cute that my dad had his arm around my mom since she's had a few failed marriages. She made a comment about it and then saw me. She asked if I only knew her through her daughter, Carrie Fisher aka Princess Leia. I told her that I knew her for her because I had seen nearly all of her movies. At that point, she made me the center of the show and kept making references to me during the rest of the performance. I was on Cloud 9; it was so awesome! After the show, My mom and I were able to get our picture taken with he (http://jennielyse.com/wp-content/uploads/2007/08/debbiereynolds.gif). She was really personable and it was just so much fun. I'm rather like you around famous people, I act like a fool (not that you did). I went to a Shannon Hale signing and told her I'd driven in the rain a long way to get there and that my husband was waiting for me in the car. That was a nice touch right? Like saying "You OWE me for driving so far to see you and bringing my reluctant spouse!" She was still so nice and wrote something like "thanks for coming so far to see me." Now I usually just quietly hand them my books and don't speak. It's better that way. Jenni- That is such a cool story about Debbie Reynolds! Great picture too. Did you feel like you were watching the show while floating from above? Melissa- Too funny. Like driving in the rain is akin to riding a horse in the rain. When I met Sara Zarr for the first time, I blurted out, "I just followed you on Twitter! I just followed you on Twitter!" I think she was probably thinking, "I just blocked her on Twitter. I just blocked her on Twitter." So I think I'm the only one that thought Smokey wasn't your cat. I can't decide if I should be embarrassed or delighted that you singled me out. Either way, Thanks. Please add the appropriate sincerity or sarcasm. Heather- You are most definitely not the only one to suggest that I invented Smokey the Cat. I have a habit of showing the same pics of him, and so others have questioned it as well. You are, however, the latest person to mention it. :) Consider yourself singled out! Heather, I didn't think Smokey was her real cat either. I asked Brodi about him about a month ago, I think. So, don't feel embarrassed. Otherwise, I have to feel embarrassed. Brodi, I think I just thought the whole experience was surreal. She was the first famous person I had ever met, so I think I just couldn't believe I was meeting her and that she was as nice as she is. Jenni- Most famous people I've met have turned out to be so so nice as well. So much nicer than you'd think. i have never met anyone famous. i am sure he didn't even care OR make a fool. but i am certain i would make a complete and utter fool of myself. I don't really know, but I suspect that although I would talk to any stranger on the subway, trax, etc., and have, if it was actually someone I recognized I would just peek at them out of the corner of my eyes and not say anything. Dorien- Can you share one of the stories? Speaking of Park City I should mention that I worked there once too. And didn't notice any famous people, although people I worked with did. So, maybe this isn't a good question for me. Still, if I actually recognized said famous person, I'm sure my previous answer was, well a good guess. So I've decided that I need to stop hanging out with you so much because you end up blogging about all the things that I want to blog about before I do. Oh wait, except the things I do wouldn't be funny enough to blog about it you weren't there. Never mind. I'd rather be redundant than Brodi-less. So I get really shy around famous people. Or I try to send them telepathic messages with my eyes that say something like, "I know that you know that I know that you are famous, but I know that you know that I know that you don't want to be bothered so I am not acknowledging you, but I know that you know that's the reason, and not because I don't know who you are." You know what I mean? Cherie- whenever I'm at a place where famous people are supposed to be hanging out, I never see them! Bree- Ha ha! I love that your eyes are so talented. And it shouldn't matter that I blog first, since you're the one with the hundreds and hundreds of followers. :) If a blog falls in a forest, and no one is around to hear it... etc. 2. They are still there but I'm totally talked myself out of talking to them in any way shape or form! Great story you shared. Super cool! Jill- so true! I often end up thinking, I can be funny or witty at times, so how come none of those times are when I really need it? Thanks for commenting! Brodi, I can act normal around Shannon now (it's been 3 yrs)--unless there are strangers around, and then I feel like I don't want to get in the way or act like I'm sharing her spotlight or anything, so too often I don't even talk to her in public, which seems awful, huh? So, yeah, there's still a smidge of weirdness on my end, despite how pathetic that is! Oh gosh! 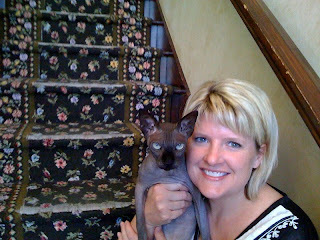 A fellow writer/sphynx owner/shy person! I did the same thing. I met Neil Gaiman and was the same. I'm so happy that I got up enough guts to shake his hand. What a thing. An I did the same thing with my hubs: "omg did you see that? Where NG asked my name? And I said it? Lol!" I'd like to pretend I would be so witty they'd instantly like me and want to be my friend, but I'm not and end up sounding stupid. Nikki- I don't think the novelty would ever wear off for me. JKB- What are the chances? I mean, how many children's writers who love hairless cats could there possibly be in the world? Good to meet you. What I wouldn't give to see Neil Gaiman in person. Kimberly- wow, Tina Yothers? THE Tina Yothers? Very cool. 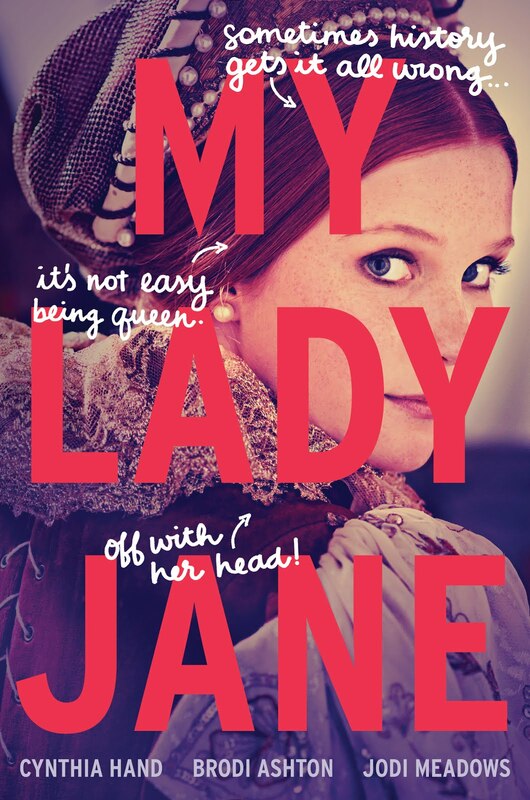 She's like, iconic for me. She probably had a poster of Michael J. Fox hanging in her bedroom too. There was ONE time I lost it around a celebrity. ONCE. It was so embarrassing that I have been calm, cool, and collected around them ever since. It was 1989 and I was heading back east for World Con in Boston. My flight out of SLC hadn't opened for boarding yet, so I wandered around the airport and walked right past Michael Keaton. He walked into the men's room. I darted around the corner and stared at myself in the bathroom mirror. My heart was pounding, I was panting, and desperately trying to calm myself so I could talk to him. Before I was ready, Michael Keaton was walking up to the sink next to me. I turned to face him and blurted out, "I JUST WANTED YOU TO KNOW THAT DESPITE WHAT THE CRITICS SAY I THOUGHT YOU WERE BRILLIANT IN BATMAN." The man hadn't even finished washing his hands yet. Doug- You did not say that! "Despite what the critics say..." So cool! I completely lost it after you flashed your chest and then stated...loudly, "Blasephemous and Inappropriate!" Brodi, thank you, I needed a laugh today, desperately and you gave me several! You are too generous! Good thing I had finished my coffee before reading your blog, otherwise my computer would me most unhappy. I always believed that Smokey was real and your cat. I still think he's cute in a very creepy...shall we say Chesire Cat way?? Yes, that's it! Were you able to put your eye back in? To answer your question, I am like you, I get shy. I also get very polite and respectful and stiffly nervous. I met a couple of great celebrities but unless I waited in line to get an autograph (which would be 2 people), I just point them out to my hubby or friend or text hubby and/or friend to say, guess who I see/saw but I don't approach them...I let them be. Okay, so when I'm in front of one of my idols, I present him with a gargantuan stack of books for him to sign. That's what I do. And then I give my friend uppers for her birthday. I'm of the "dreaming of them liking me so much and becoming BFFs" type of fan but then, in person, I get so nervous and afraid of saying the wrong thing or looking all fan-girly or dumb that I get all tongue-tied and can barely talk. Or if I do, I say something dumb. There was one time during the Olympics in SLC in 2002 when Kristi Yamaguchi was speaking/appearing in an outdoor evening program downtown. I had to take my kids and husband home from downtown festivities first, drop them off, then drive all the way back from Magna, find somewhere to park, and sprint several blocks in the freezing cold with my sisters to make it back to see Kristi. We were too late--the program was just ending--but we waited outside the City & County building for a while. Finally (this was like 10:30pm by now, very dark and cold!) a group of people came out. It was Kristi and her family and entourage, along with Gladys Knight! They passed us and none of us could get up any courage to say a thing. We watched them walk away in silence. Finally I thought, "It's my last chance, now or never" and I ran after Kristi, yelling "Kristi!" I don't think the group heard me...thank goodness!...but when I came back to my sisters, shame-faced, they were nearly on the ground, laughing. "That wasn't her at all," they gasped, holding their sides. "That was her sister." Brodi, I've only met "Mormon" celebrity types. And only in situations where what I had to say to them was already scripted for me. And only in situations where "quiet dignity" was my assigned demeanor or I would have been canned. ha ha. But I did feel stupid telling Elder Bednar I would have to "dumb down" his comments for the Friend audience. Would E. Bednar appreciate being "dumbed down"? I think not. But at least I did not call him blasphemous or inappropriate. I also sat next to Elder Holland at a lunch party and did. not. say. one. word. p.s. I'm pretty sure I saw the one-armed man in Williamsburg. I was too afraid to talk to him. Una- I'm glad you think Smokey is semi-cute. Valynne- You also knock over shelves of books, don't you? Kiiri- Oh no! So funny it wasn't Kristi at all. I would've done the same thing. Kim- I wouldn't have said anything to the one-armed man either. I wonder if he ever wants to scream, "I played other parts too, ya know!" When I was in fifth grade, Brandon Mull came to our school to talk about using your imagination and stuff, and I got to eat lunch with him and a few of the other kids. 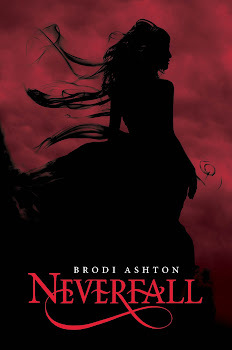 He signed my copy of Fablehaven, and I just stood there and said something along the lines of, "uhhhhhhhh.........."
It's pretty awesome when you meet somebody famous... and then the next second you're sitting there thinking, "What did I just do?! I can't remember what I said but I know it was stupid." I've done it multiple times. Okay, you have the coolest stories...and cats. I have never had a brush with an idol; but I did sell Carol Mikita clothes when I worked at Talbots. I was cool as a cucumber, I tell ya. That woman is very tall, by the way. I'm a mix. I think, in general, I'm pretty collected. But I can't be sure because inside I'm all !!!!!!! And then afterwards I analyze every moment over and over until I'm not really sure what happened, I just know that [insert tiny detail here]. So. I met Nic Bishop tonight, author and photographer of the awesome book Frogs. I think I was collected. But maybe you should ask him. He was really cool. Hannah- I did the same thing when I met Brandon Mull a a couple months ago. And I'm much older than fifth grade! Keersten- Carol Mikita totally counts. I served frozen yogurt to John Stockton once. Acted like I didn't even recognize him. Alysa- Where did you meet him? I love that book. Smokey is very cute, he has those big eyes that convey to you, "you love me, you know you do so bow down and worship me." No wonder the Egyptians worshiped them! Come to think of it, my cat has that same expression. So many of us have what I would consider the "meeting Santa Christmas story style" experiences. You have it all planned out but when you get there, you freeze and when you leave, you're kicking yourself for being brain dead. I always thought it was just me...must be universal, except for those few cool cats, like Sara. unflappable...because I am famous myself. :) Along time ago I decided to not be "star struck" with "celebrities" and believe it or not, it works. They actually think your someone famous (and worth knowing) too. guess that's my 2 cents--'bout what all my advice is worth. Una- Smokey totally knows he was once worshiped in a former life. Sis- I agree. You would remain unflappable. Always. Um, I can't even talk to someone who's NOT my idol, so I'd probably melt if I ever saw mine! Which, I'm not sure who that is. But I'd still melt. Do you have to put lotion on Smokey? And sunscreen? Or a cream when the weather gets cold and dry? Marianne- No lotion because the longer he goes without a bath, the more oily he gets. After a few weeks, he starts leaving a little oil slick on the furniture, so he needs baths every two weeks. He also has sensitive skin, so he would get sunburned if he spent too much time outside, but he's not really an outdoor cat, so it's not an issue. He gets cold easily, so usually he snuggles into a blanket to get warm. Brodi, between you me and the fence post, Sam has way better hair. I'd stick with him for sure. As for meeting famous people, I'm the "so shy I pretend I'm unflappable/don't care" kind. I generally say something stupid, and then try to cover it up by saying more stupid things (it never helps, by the way). Last time I went to see one of my favorite authors (someone I am absolutely crazy about), my boss laughed and said, "Are you going to embarrass yourself?" I said yes (and I kind of did). Cassie- So, what did you do? I'm always doing stupid things in front of cool authors. At least this time, when I met Sherman, my friend Valynne was the one who knocked over a shelf of books. I've never met anyone famous, I don't think, so I wouldn't really know how I'd react. Probably hysterically. Briana- You and me both. 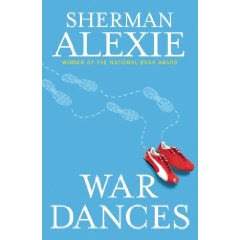 Your Sherman Alexie story beats all. You crack me up Brod. How could he forget "Violent?"